It doesn't take a rocket scientist to see why Phuket, Thailand's largest island, was, is and will be a popular destination. 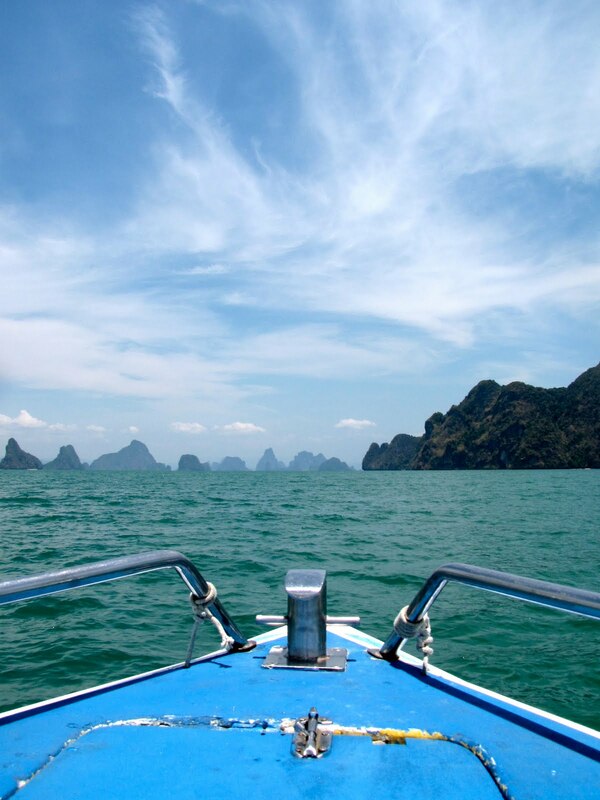 Lapping its edges, the Andaman Sea is spectacularly beautiful, its brochure-blue waters interrupted by romantic islands, exotic looking watercraft and striking thrusts of karst that form almost hidden coves. The interior is mountainous and precipitous slopes can be encountered along the edges. The eastern side is less touristy, the western side, especially at Patong, is international party central. You can drive from one side to the other and back again in an hour or so. First things first: pronunciation. It is NOT the version that rhymes with that favorite expletive or buck-it. 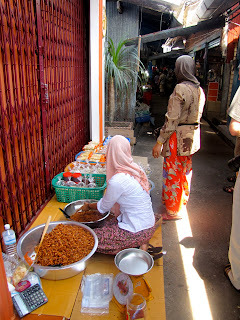 Phuket is pronounced Poo-kett, despite the sexually explicit shops and offers you're bound to encounter in Patong. East. Phuket Town is marked on the maps but it's hard to tell exactly when you've reached it. The strip-store virus is rampant. I was so busy with water-oriented activities there wasn't time to explore the town or, horrors, even shop. I'm told the east side is where the bargains are. 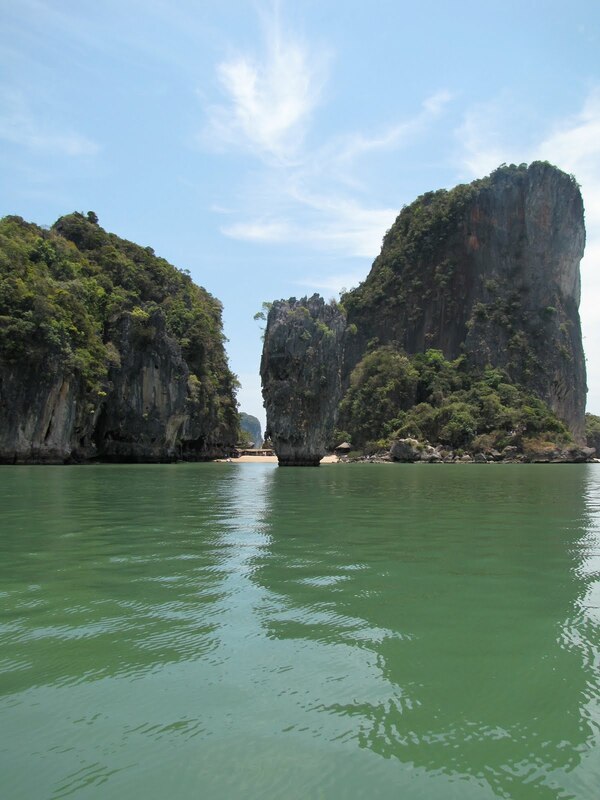 Spent the better part of three days in the Andaman sea and wish it could have been more. The first day was in a speedboat around the fascinating islands that make up Phang-Nga Bay. Thank goodness for digital cameras and high capacity memory discs because I never stopped snapping away. Incredible vistas. Just when you thought you had captured the image, here comes another, even more dramatic island. 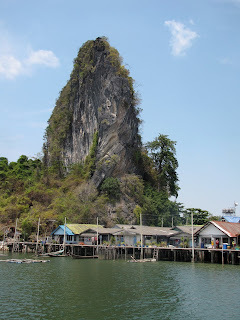 Koh (Thai for island) Ping Kan, known as James Bond island since its appearance in The Man with the Golden Gun, tourist boats and all, is pretty spectacular. It took a bit of peering and adjusting for glare but I did see the ancient paintings of boats and animals on the rock walls of Khao Khien. Koh Panyee is a steep island with a village on stilts over water founded about 200 years by three Muslim families. Since then it has grown to an enclave of about 1,500 Muslims whose fishing has morphed into the feeding and souvenir supplying of tourists. We were the only ones at the time which made us pretty popular even though we had left our pocketbooks on the boat. From there we made a beeline to lunch on a lovely beach where we took our first dip in the Andaman's waters - warm with strips of cold currents from somewhere. In short, like heaven. I just wish I and my companions could remember its name because there was a nice little resort there. However, after rising at 4 a.m. in Bangkok to reach the airport for the early plane to Phuket, much of our first day there is a blur. 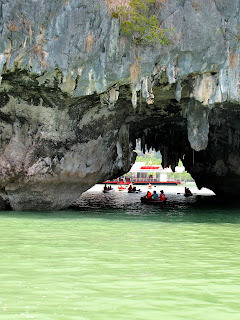 I think it was in the Hong islands near Krabi but don't bet money on it. Last stop was a snorkeling spot. It didn't look too promising until our guides peeled a banana and began tossing slices in the water. Wow. Do Thai fish go bananas for bananas. Must try that on American and Caribbean fish. We stayed at Vijitt, a lovely seaside resort tucked in the hills at the southeast tip of Phuket. Steep inclines and unusual placements of furniture and bath facilities plus a dearth of lighting makes me hesitant to recommend it whole heartedly to Levelers. However, like too many places on this Thailand trip, I never had time to fully explore much less utilize the facilities. The infinity pool was gorgeous, the food was excellent, there's a spa, a cooking school and the most fragrant soap made on site. NOTE: For a recipe from Vijiit, go to my other blog, Food Afar: Recipes from a Travel Writer. Tip: Like many similarly situated resorts in Thailand, Vijiit maintains a fleet of golf carts that ferry guests from their cottages to wherever they want to go within the complex. It is efficient and pleasant to be delivered door to door so don't let topography deter you from staying anywhere offering this service. 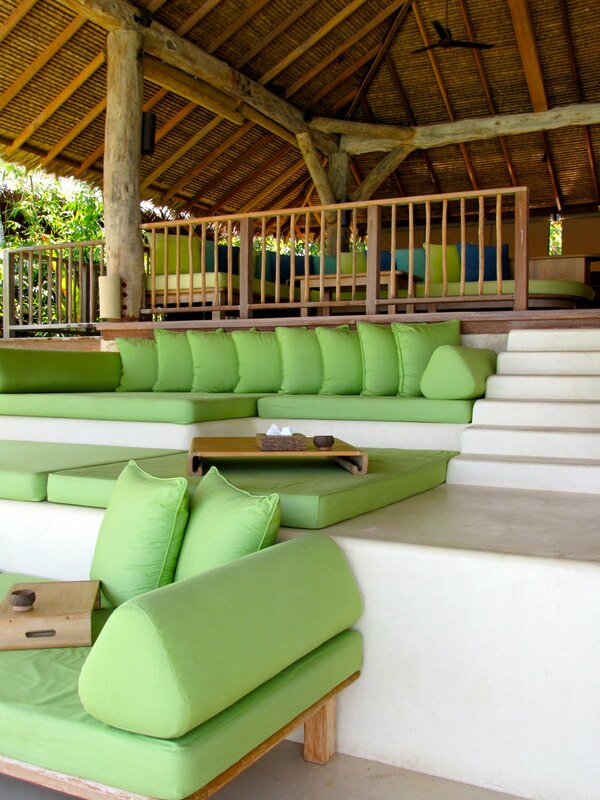 Day two brought a dream destination - Six Senses Hideaway on the island of Yao Noi. Picked up at a marina for the hour-long ride across the Andaman Sea in the handsomely appointed runabout, we eagerly anticipated a spa treatment and lunch at this tres chic escape. The massage, a combination of techniques rather than the Thai massages we had been spoiled with, was one of the best all of us had ever enjoyed and the surroundings were rustically elegant and comfortable. Warning: Yes, but the massage rooms were a good walk or stair climb away from the reception area. We were requested to remove our shoes before the walk/climb which was fine in the morning but when we were done those wooden stairs and walkways were hot enough to seriously burn your feet. Ask your attendant to bring your shoes to you before leaving the treatment room. Afterward, before taking a tour of accommodations, we relaxed in the pavilion around the lovely lily pond with something wonderfully cool to drink. Hated to leave but even better awaited - lunch at the top of the world. 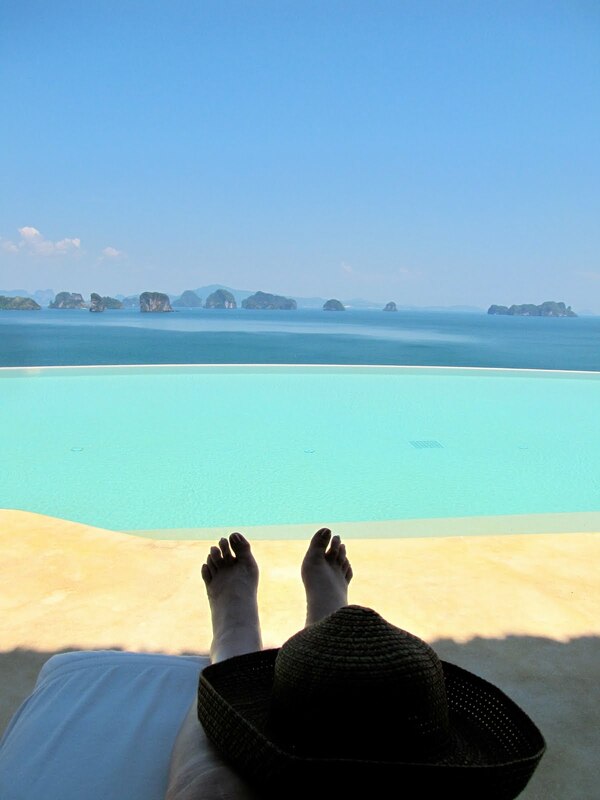 This three-suite villa is superbly outfitted, comes with infinity pool overlooking islands in the Andaman Sea and did seem as close to heaven as one could get. We were guests of the manager who was joining us for lunch so you can just imagine the quality of service. The food truly was angelic with just enough of Thailand's devilish spice to keep our attention. If you ever have the opportunity to see and sample it, do so. 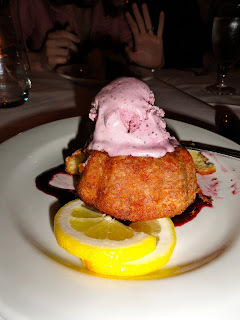 NOTE: For a recipe from our meal that day, go to my other blog, Food Afar: Recipes from a Travel Writer. 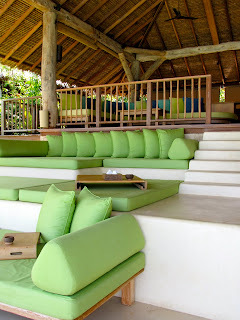 Tip: SS Hideaway is situated along the steep sides of a mountain so only the man made elements are level. You will encounter stairs, too, so make sure the golf carts are running before you book. 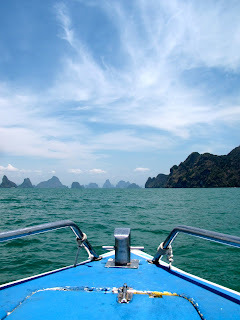 Next post: By sea around the cape to Patong and the wild west - and secluded elegance. You don't have to be horse crazy to fall in love with Lexington, KY, and the charming towns surrounding it. The scenery is idyllic. Gently rolling hills and day-glo green pastures are divided by white or brown horse fencing and spotted with impressive homes, many antebellum, and barns with spires. 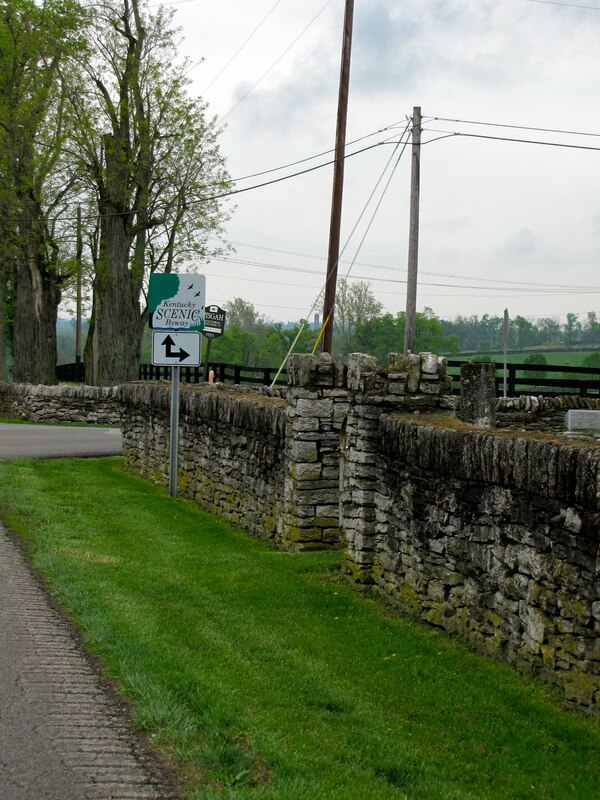 The up and down curving country roads lined with stacked stone fences will have sports car drivers salivating and Anglophiles with a case of deja-vu. You've just enough time to get up to speed before reaching another, Oh, look at that moment. 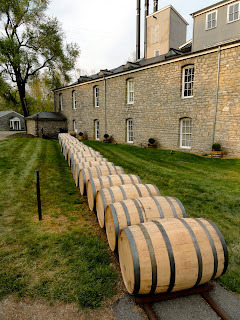 Non-equestrian activities range from spending a day in a Shaker village to sipping your way along the Bourbon Trail. Shaker Village of Pleasant Hill is America's largest restored Shaker community. April through October costumed interpreters and crafts people bring the original back to life, complete with horse and wagon rides. May through October, you can take a ride on a riverboat. Tip: There are a dozen hiking trails ranging from 1-mile to 6-mile loops, easy to strenuous, if you feel up to it. Otherwise, tour, shop, eat, even stay overnight. The seed-to-table restaurant is a destination must-do for many locals. Waveland State Historic Site, a Greek Revival built by a grand-nephew of Daniel Boone. Warning: When it's historic, you are going to encounter stairs with no alternatives. Bourbon Trail. Kentucky produces more than 95 percent of the world's bourbon, the adult beverage that statesman Henry Clay used for "lubricating the wheels of government." 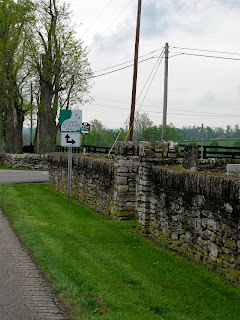 The eight historic distilleries - Buffalo Trace, Woodford Reserve, Wild Turkey, Four Roses, Maker's Mark, Heaven Hill, Tom Moore and Jim Beam - that make up the trail are in the Lexington Bluegrass area. 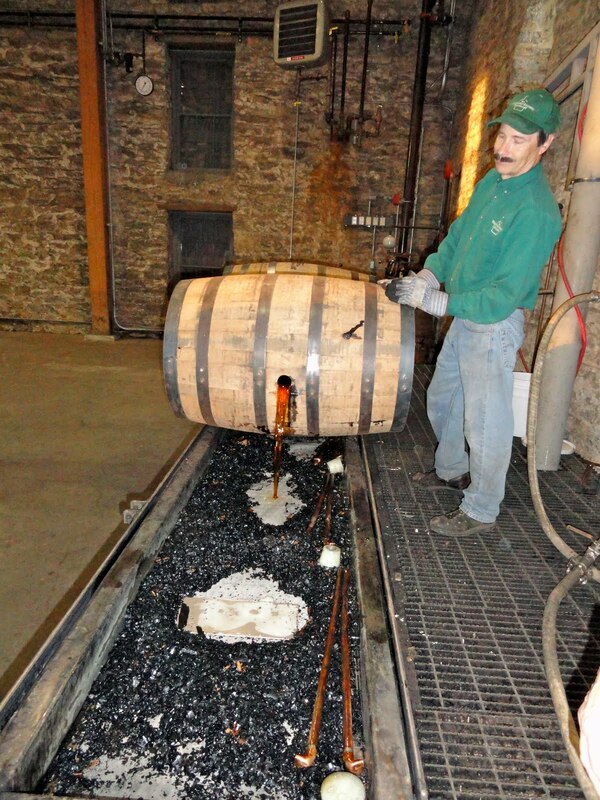 Both Buffalo Trace and Woodford are local favorites. All offer tours and tastings, many require reservations and all have gift shops and historic photographs and memorabilia. Warning: Hills and stairs are a given but a few, such as Heaven Hill in Bardstown makes a tour of the 50-acre property easier with a trolley. Best of all, the drives between them will take you through some of the Bluegrass' most beautiful countryside. Even National Geographic says so. Revolutionary and Civil War sites abound in these hills and dales if that's what pulls your gotta-go cord. For book worms, Joseph-Beth Booksellers has been named by Publisher's Weekly as North America's best bookstore. Where to eat. It will take a dozen visits of multiple days to try all the destination-worthy eateries in the area. I can personally recommend Dudley's on Short - although it's no longer on Short everyone still calls it that. It's possibly the only place you'll find a "living" salad - they grow the greens hydroponically and cut per order. The bartender makes a truly classic and divine martini. 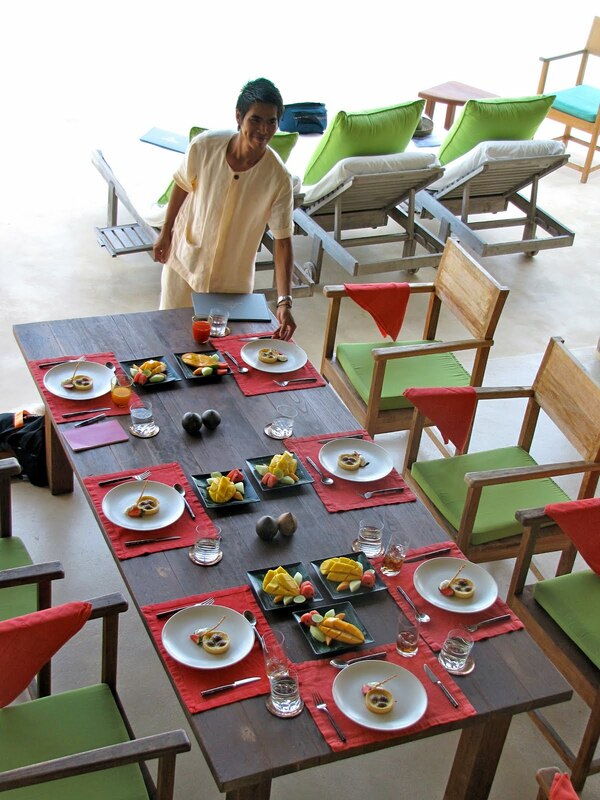 Anything Chef Ouita Michel prepares will be memorable. You can dine in a National Historic Register building at Holly Hill Inn, the restaurant she and her husband Chris developed. In fact, you could spend a day with Ouita's inspirations. Have breakfast of lunch at her popular Wallace Station Deli - ham and brie panini was my fave - then spend the day touring and roaming the countryside until dinner at Holly Hill. Both are in Midway, a charming little railroad town that's worth a stop to shop in its boutiques. Jonathan at Gratz Park in one of Lexington's historic hotels is famous for the refined regional fare of Chef Jonathan Lundy. The dining room is lovely but for a clubby, local atmosphere, try to snag a table in the bar. It can get a bit noisy but you'll have fun and perhaps make some new friends. 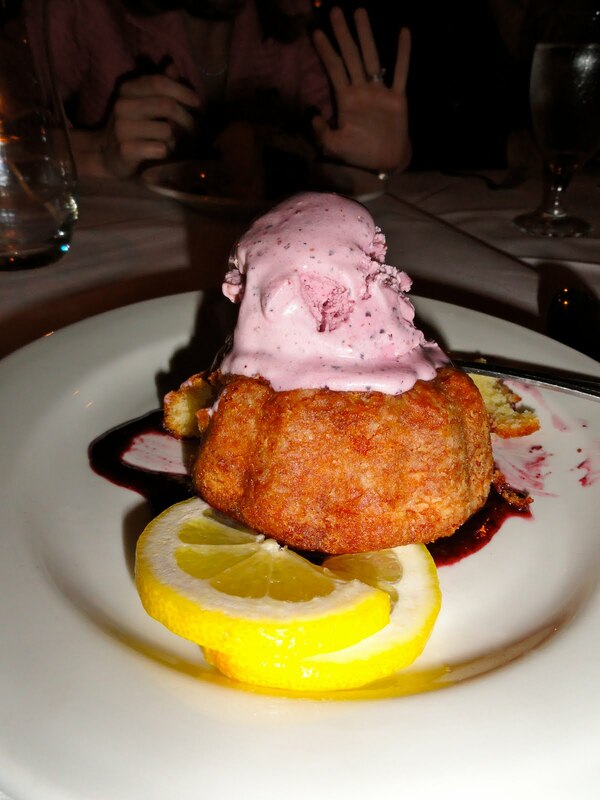 Wherever you dine at Jonathan's, do not miss his homemade ice creams. Yumm. And wherever you go, prepare for residents to treat you like a favorite new member of the family. Stay here more than 24 hours and you'll wish you were. For all the information you need for a memorable stay, go to www.visitlex.com. Lexington and thoroughbreds go together like bourbon and branch (that's the purest of water in Southern speak). From the horse farms that line every road and the idyllic Keeneland Race Course to the tasteful horse- and dog-themed merchandise that fills L. V. Harkness & Co (not to mention the most extensive and glorious collection of china tableware I've ever seen), you are never far from the real thing or its image. 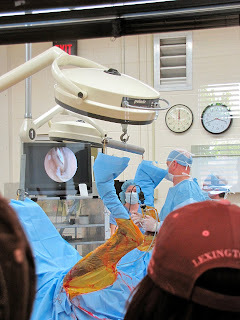 I visited two Thoroughbred farms and passed by dozens on my visit, spent a delightful afternoon trying to pick winners at Keeneland, plus took a fascinating tour of Rood & Riddle Equine Hospital, the horsey equivalent of the Mayo Clinic. Tip: Thoroughbreds are valuable, so wherever they walk, the surface will be well-groomed, good news for Levelers. 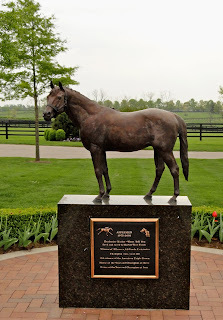 Darley at Jonabell Farms is home to such famous stallions as Street Cry (sire of Zenyatta) and Medaglia D'Oro (sire of Rachel Alexandra), who were in adjacent pastures the day I visited; Bernardini; Elusive Quality (sire of Smarty Jones) and the gracefully aging Holy Bull. This is where the last Triple Crown winner Affirmed, bred and owned by Patrice and Lou Wolfson, stood at stud, died and is buried adjacent to the stallion barn. 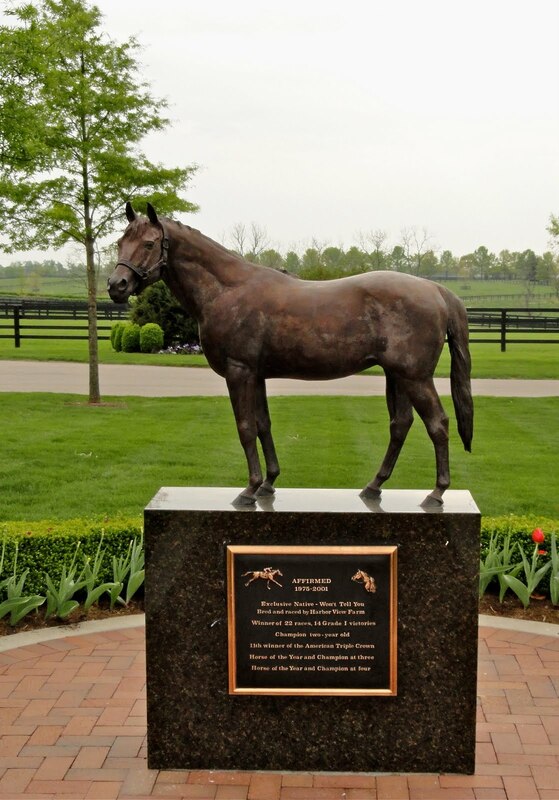 Most thoroughbred race horses of note have their head and hooves buried and memorialized, but Affirmed was buried in tact, standing up and facing visitors. Tip: Owned by HH Sheikh Mohammed bin Rashid Al Maktoum, ruler of Dubai, Darley at Jonabell is a showplace and one of the best places for Levelers to tour. You walk on paved surfaces that are relatively flat and the interesting tours are compact. Visitors are welcome by appointment and tours are frequent, www.darleyamerica.com. 1-859-255-8537. Keeneland is a gem and, from its opening in 1936, perhaps the only not-for-profit race track you are likely to find. It lives up to its motto, "Racing as it was meant to be." There is a family atmosphere, inclusive in most areas, hospitably exclusive in a few. The food is good, the surroundings are idyllic - you look across the track to horse farms - and the gift shop is one of the best. There's even a picnic ground for the many who come early, tail gate and make it a full day. Only drawback: The two racing seasons, spring and fall, are short. Tout Lexington makes it a point to attend at least one day of each, however, and so should you if lucky enough to be in the area at the right time. If not, the public is welcome to watch morning workouts year-round and its track kitchen is famous for cheap, filling and good breakfasts. www.keeneland.com. Rood & Riddle is a remarkable facility with its 50 vets and staff of 200-plus. The highly sought-after tours of it are eye-openers. 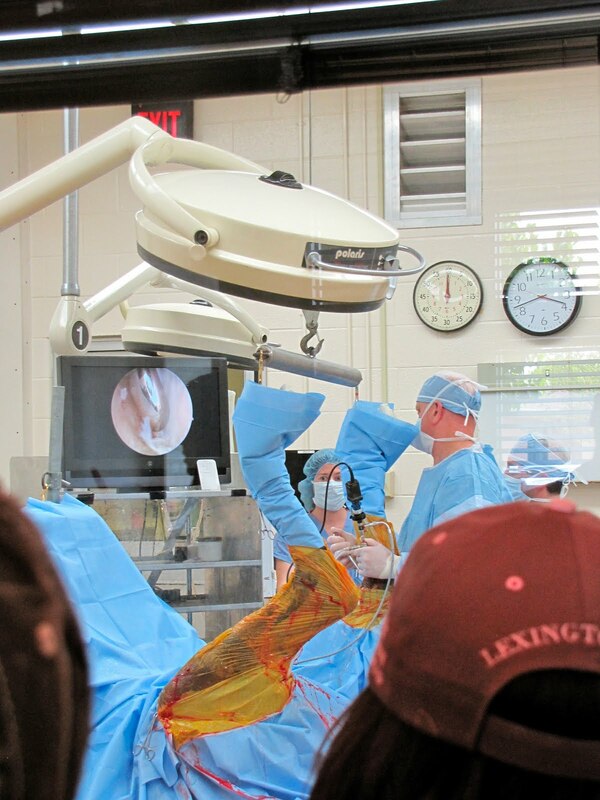 Equine medicine has made giant advances. At the most basic level, horse shoes, the array of shoes in its podiatry center almost puts Nordstrom's to shame. Tip: Again, flat and smooth for walking but you'll stand a lot. 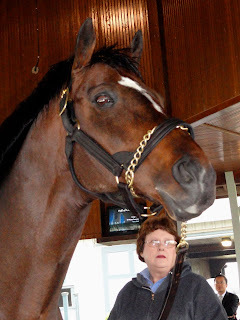 Good read, great information: Patti Nickell's Horse Lover's Guide to Kentucky. If you love horses, you have to visit Lexington. If you love good food and drink among beautiful scenery and congenial people, you need to visit Lexington, too. I did, as a guest of Visit Lexington to preview the Alltell FEI world Equestrian Games in September-October, but any undue influencing already had been done. One of my early memories was sprawling on the floor listening to a radio program that was interrupted to announce the death of the great race horse Man o' War. That was Nov. 1, 1947, I was 6 and could recite the wins of Big Red and the one horse that ever defeated him, aptly named Upset. You could say I was predisposed to like Lexington, at least the horsey part. I was delighted to find that Lexington, one of the most influential sires in American Thoroughbred history, has been miniaturized, dyed blue and become the infectious logo for Visit Lexington, promoters of the center of Kentucky's famed bluegrass and Thoroughbred industry. Also liked that we were staying at a hotel filled with equestrian images, Griffin Gate Marriott Resort & Spa, and that the rooms featured Tempur-Pedic beds, a Lexington-made product. Visiting the Kentucky Horse Park was both a joy and a pilgrimage. Rain didn't douse my enthusiasm as I paid homage to Man o' War and the great African-American jockey Isaac Burns Murphy at their grave sites; met the racing legends Funny Cide and Cigar and American Saddlebred champ CH Gypsy Supreme in the Hall of Champions. The park is working horse farm, theme park, education center, museum, competition facility, headquarters for 33 equine organizations and showcase for up to 53 different breeds. Non-horse fanciers find the International Museum of the Horse fascinating and enjoy the different skills displayed during the Parade of Breeds. Art connoisseurs will appreciate the equestrian bronzes, many life-sized, around the park. You can try riding to a walk, trot and canter on the simulators (like the ones used filming Seabiscuit) at the Morgan Horse Exhibit or schedule a ride on the real thing (for an additional cost). Tip: The terrain is mostly flat with a few gentle hills and smooth or paved for walking, but you will walk a lot. Take the free, horse-drawn tour of the main part of the park to orient yourself and decide what you want to see. You walk to but get to sit during the Parade of Champions at the Hall of Champions. You'll walk around meeting residents of the Breeds Barn but you'll sit during the Parade of Breeds when the horses show off their strengths. If you aren't a horse nut, the Park will entertain you for a full day, especially if one of the many competitions held there coincides with your visit. If you neighed before you talked or spent childhood afternoons galloping around the neighborhood, you will want more, much more. And much more to come about Lexington, its Thoroughbred industry, fabulous food and drink and truly hospitable residents. Back from hip replacement with a tip for handling stairs, thanks to physical therapists from Brooks Rehabilitation Center. Stairs were a sophisticated answer to building on steep slopes and you can understand how the "nearer to the gods" philosophy of siting the most important structures on the highest points took hold. So I guess it was natural for later architects to manufacture their own hills of steps in order to make buildings appear more monumental and important. Having to climb to the top to see the good stuff is a bugaboo for many of us travelers. 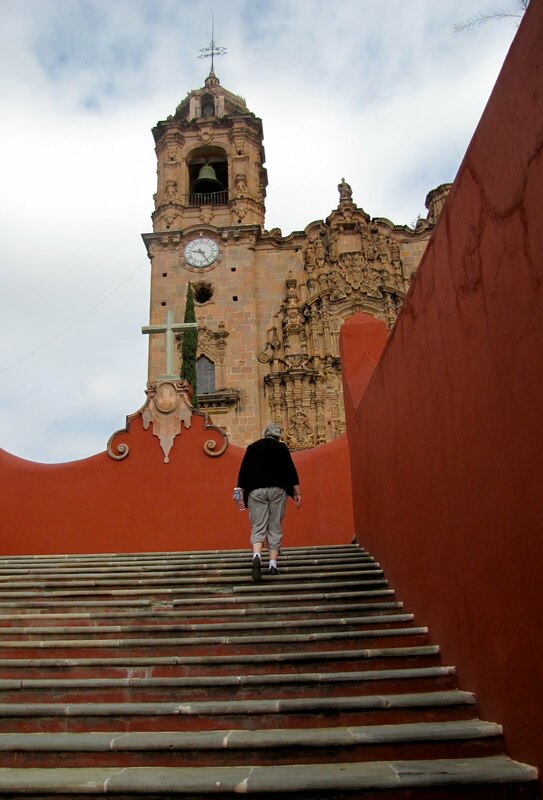 It's impossible to avoid steps, especially when traveling in countries without accessibility requirements. Tip: When you absolutely have to get to the top - or bottom, take steps one at a time - both feet on one before going on to the next. It's the safest and least physically stressful way to go. Up with the good, down with the bad. That's an easy way to remember to step up with your strongest leg, down with your weakest. Use the railing or wall for stability. You'll see the wonders at the top and return safely.